The accompanying notes to the release of the FOMC minutes on October 17th indicated expectations from a majority of members to eventually push fed fund rates above the level that they would otherwise view as neutral. In the most recent projections, the average of members’ estimates for the neutral level by 2021 is 3.0%. We understand the hawkish tone these notes carry within the context of the mention of the Beveridge Curve. 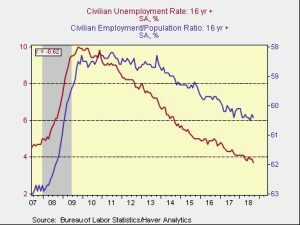 According to this data, the labor markets appear to be tight. 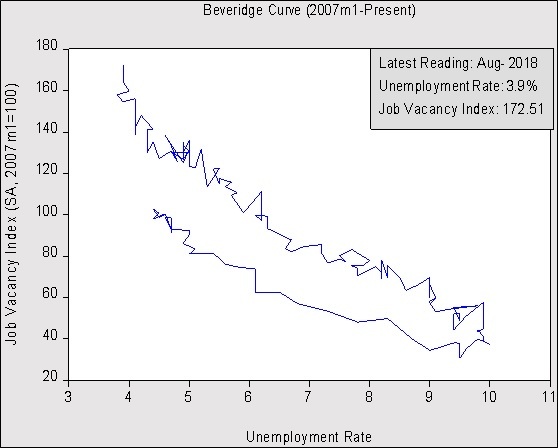 The chart below shows a modified Beveridge Curve, which is a graphical representation of the relationship of the number of openings represented as an index and the unemployment rate. The chart starts toward the end of the previous cycle in 2007 and tracks the relationship through the end of August. The lower end of the curve represents the slowing momentum in the previous cycle and the higher end of the curve represents the current cycle. A reversal of the curve would typically signal an inflection point within the cycle; a reversal downward toward the right signals deceleration, whereas a reversal upward toward the left signals acceleration. 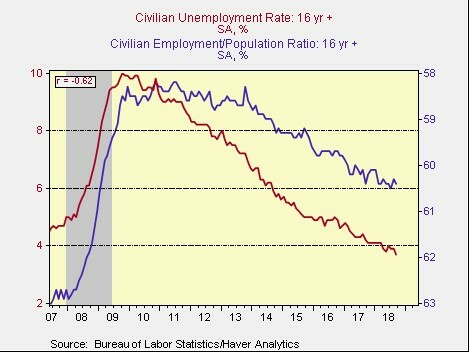 According to the chart below, the Beveridge curve continues its upward trend as job vacancies hit a cycle record at 172.51 in August, while the unemployment rate remained steady at 3.9%. Although the Beveridge Curve suggests there is tightness in the labor market, the chart below indicates a degree of slack still remains. Wage growth is widely perceived as being insufficient to encourage longer term unemployed individuals to re-enter the labor market; hence the concerns of some market participants that Fed tightening could lead to an economic downturn. Though we acknowledge overly tight labor conditions can lead to inflation surprises, at this juncture we view the inflationary data to be productive and not hostile. Moreover, the Fed actions appear to be geared toward asset inflation as opposed to inflation in the real economy. In light of Fed tightening, we don’t expect an acceleration of the pace of rate hikes; thus, financial markets should be able to adjust without significant disruption. Due to JOLTS being published on a one-month delay, August is the latest reading. The current unemployment rate is 3.7%.